It’s hard to quantify and define the experience of virtual reality to an outside party. Words like “presence” and “immersion” come to mind, but don’t capture the effect of what it’s truly like to lose yourself in a mystical world, and the sensation of pulling off the headset to come crashing back into a normal, unassuming room. The HTC Vive makes great strides in creating a virtual reality experience like any other, but in doing so, it also becomes less of a “bedroom peripheral” than you might want from a headset. The Vive kit comes in gargantuan box, filled with the many different cables you may (or may not) need for hooking it up to your PC. The key component is the headset, a strapped-on display with lenses and output cables snaking out like input jacks for the Matrix. There’s also the two remotes, the dual controllers for your VR experience; while an Xbox One controller or mouse-and-keyboard combo can be used, most Vive experiences make use of two motion-detecting remotes. All three of these items are tracked around the room by “towers,” two laser-emitting cubes that sit in opposite corners of your designated VR playspace and transmit locational info to your computer. The headset comes in a nice case, able to fit every piece of the hardware puzzle. On the headset side, you have a few options for setting up your new portal to a virtual world. A link box makes the connection between your Vive and your PC, with the snaking ~15-feet of cables from the headset connecting into one end and the PC-side cables into the other. You’ll need a USB port, which is easy enough to spare (though some issues with 3.0 ports are known to happen, your mileage may vary), and a means of connecting your graphics card to your link box. This means an HDMI cable, if you have two HDMI ports on your GPU, or else you’ll need a DisplayPort-to-miniDisplayPort cable, which probably means a quick trip to your local Fry’s or MicroCenter. Actually being inside virtual reality and seeing entire worlds appear around me, though, I was able to put those woes behind me. The Vive headset was lauded before release for its high specs, and those commendations still hold true in the final release. A great resolution and solid framerate on most games meant that being in VR was, for the most part, comfortable. There was little to no screen-door effect, and though I would’ve liked just a few more pixels-per-inch, the display’s overall fidelity left me wanting in very few, minute areas. Text is the biggest hurdle to overcome, as visible words can be anywhere from legible to a blurry mess. Other features round out the headset nicely, like the relatively lightweight construction, a dial for adjusting IPD (inter-pupillary distance, or the distance between your eyes), and several different straps for adjusting the load of the headset. I particularly appreciated the headphone jack running directly into the headset, as it let me use my own headphones rather than a set of attached proprietary cans. Experimenting with many varieties, I settled on using a set of iPhone earbuds mostly for the low-impact and ease of exchange between users, but even using my bulkier headphones worked naturally with the Vive. The bumps and smoothed edges looked odd, but I liked the overall design of the headset. While the headset’s ergonomics are top-notch, the towers are where I immediately took issue with the Vive. The Vive towers are, simply put, the biggest make-or-break for whether you should purchase this headset over other options. 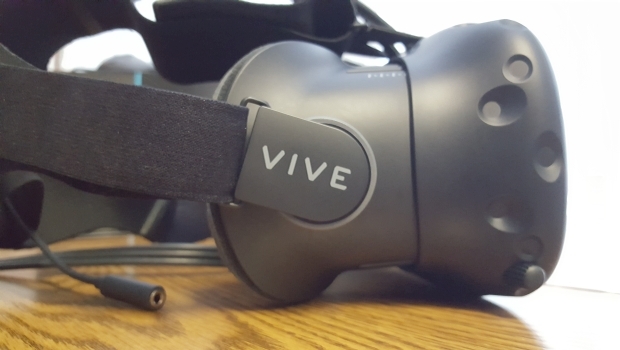 Within the confines of a designated “virtual reality room,” the Vive fires on all cylinders. The ability to move around an area, picking up and touching things with your remotes, being able to get on all fours and peer under objects is simply incredible, and so far Vive is the only headset that does it. If you’re someone with a lot of space and the ability to easily remodel the living room for virtual reality, you’re going to get more impressive and immersive experiences from it. In my own experience, though, a couple weeks spent with my loaner Vive made me realize how little my current conditions allowed for such a demand of real estate. Set-up in my bedroom, I was able to move around a little, but only just outside the immediate available area. Playing the Vive is incredible, but it requires space and adaptability, something that many apartment-dwellers or even full families may not have to spare. The two towers, my laser detectors and catalysts for room-scale VR. The trade-off is you can experience room-scale VR, a concept that is wholly unique and, despite novelty, is frankly incredible to have sitting in your room. Some experiences better capture this than others, though; while theBlu transported me to an underwater utopia and Hover Junkers put me square in the middle of a steampunk shoot-out, other games made me feel nauseous from shoddy VR integration or were just frankly underwhelming. Yes, nausea is still a thing — your queasiness may vary depending on the quality of the game, but there’s no warnings akin to the Oculus Store in Steam’s VR storefront, so you’re left to your own devices to know which demos you’ll be fine to spend hours in and which will have you reaching for a bucket. I use the term experiences rather than games specifically to illustrate what’s currently available on SteamVR and the Vive — many of the games I demoed amounted to simply that, an “experience.” It’s a nicer way of phrasing “tech demo,” but my most jarring realization with the Vive was that many of these experiences lose their luster after a short amount of time. It’s still fun to see others toy around in The Lab or knock a tennis ball back and forth in #SelfieTennis, but I’m not eager to return to either. The few that did have me coming back for more were games like Hover Junkers, that take the full range of motion and input possible with the Vive and actually do something with it, to create something I’m going to want to boot up more than once or twice in a blue moon. The Vive remotes, which felt almost natural after mere minutes. Honestly, I enjoyed my time with the shadier side of VR more, exploring the dark corners of random indie tech demos and one-off projects made for the Vive. These, like Hover Junkers, explored the things I actually wanted to see worked with in virtual reality — ideas like virtual intimacy, spatial reasoning, and the physicality of using the Vive remotes were better explored in these places. I love the idea of things like Albino Lullaby and Elite: Dangerous, but that’s just a new perspective — I want to see people make games for VR that make me reconsider how games can work, and how perception can fully alter a game. I’m reminded of two specific moments in my time with the Vive. One was in Hover Junkers, as I played my first team deathmatch. I quickly zipped my junker over to my other teammates and, completely non-verbally, we waved and communicated with each other. One person instantly took command, and through simple pointing and signals akin to Army handsigns, we organized ambushes and flanking maneuvers. In another, I was exploring a tech demo from the aforementioned darker corners of VR, which simply placed rendered models from other games in front of you and let you rotate them around. In this aptly named “SFW” version (it is the internet, after all) you just selected a character and admired what a game model looks like in VR, sans the seedy undertones. But the first time I tried it, with a model of Quiet from Metal Gear Solid V, I literally jumped in shock. It wasn’t just her sudden appearance that startled me, but the presence of another object, a relatively lifelike figure, within my personal space. As my mind reminded me I was in a virtual space, I calmed a bit, but there was always an eerie feeling of presence, that if you reached out close enough, you might feel some sort of haptic feedback. It’s like that game siblings love to use to torture each other, repeating “I’m not touching you” while barely hovering a finger in front of your face. There’s a tingle, a sense that something is there and if you barely moved an inch, you might create contact. That physicality, the pseudo-tactile nature of interaction in VR was what compelled me through tech demo after tech demo, and though I found myself wanting in the long run, it’s the sort of thing that sells you on the technology. The Vive is intensive, ergonomically demanding, and a little frustrating to deal with in your PC’s ecosystem. But if it can recreate that feeling, that moment where you’re overcome with a kind of feeling you didn’t think tech could ever create in your lifetime, it might be easily worth the asking price and demands. The HTC Vive offers an experience unlike any other, at the price of your real estate and patience. Though lacking in meaningful experiences now, the tools are in the right place. As far as early adopter tech goes, this is certainly the headset for a VR enthusiast, though skeptics may want to look elsewhere.